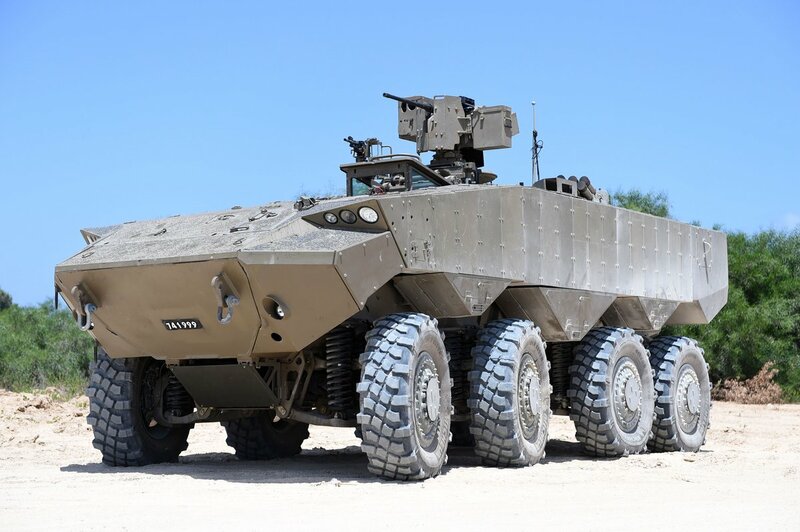 Israel unveiled Monday its indigenous Eitan demonstrator, a wheeled, actively protected armored personnel carrier (APC) that it hopes to purchase in vast quantities over the coming decade and beyond. At less than 35 tons, the 8x8 wheeled Eitan – Hebrew for steadfast – weighs and will cost nearly half that of new Merkava Mk4-based Namer heavy carriers now in production, according to MoD. Both new vehicles are designed to carry 12 infantrymen and will replace the thousands of M113s that still support the bulk of Israeli infantry forces. Eitan is expected to incorporate a new generation of active protection, based on the Trophy Active Protection System (APS) developed by state-owned Rafael. It also will feature an advanced, unmanned 30/40-millimeter turret and a full compliment of munitions and sensors. Matzliah said the project was borne from operational lessons learned from the 2014 Gaza war. 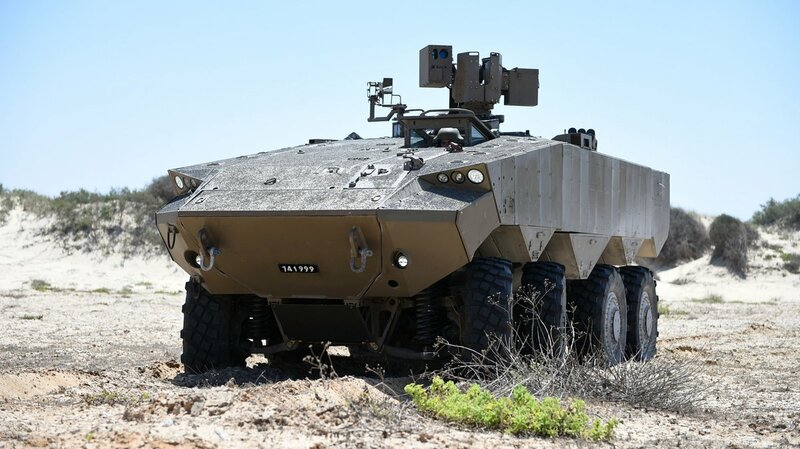 Capable of unassisted road travel at more than 90 kilometers per hour, the Eitan – the first wheeled carriers in Israel’s military history – “enable fast, strategic mobility” and are “tailored to the existing threats in the arena,” Matzliah said. In an Aug. 1 announcement, MoD said the Tank Production Office and the Israeli military’s Ground Forces Command have just started a series of field trials to determine performance in “varied and complex” conditions. 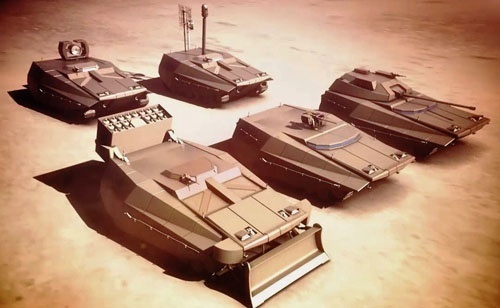 The plan also includes development of another demonstrator program called Carmel – a Hebrew acronym for Advanced Ground Combat Vehicle – aimed at driving the design of a future tank to be deployed as a compliment to the 65-ton Merkava Mk4. The officer said Carmel is not intended to replace the Mk4, which will remain in production through 2020, but is rather a demonstrator program to evaluate a state-of-the-art, medium-weight combat vehicle. It will most likely be treaded, not wheeled. Under the Army’s Ground Horizon plan, Eitan is expected to be ready for fielding in about five years. In contrast, Carmel is not expected to enter service until 2025 or 2027. על בסיס ה"איתן" מתוכננת להיבנות משפחת כלים למשימות שונות: החל מכלי לניוד 12 לוחמים ועד לכלי המשלב כוח אש מתקדם בעל צריח נשלט לא מאויש עם תותח 30/40 מילימטר. Variants for different tasks are planned to be built on the basis of "Eitan": ranging from the mobility for 12 fighters to a variant that combines advanced firepower with a remotely controlled turret with a 30/40 mm cannon. מערכות לחימה: מעמדת נשק קטנה ועד לכלי לחימה בעל צריחון בינוני עם תותח 30-40 מ"מ; מערכת מיגון אקטיבי. Combat systems: from small arms to a medium turret with 30-40 mm cannon; active protection system. The Eitan will weigh 30-35 tonnes, have a 750 hp engine, and be able to reach speeds of up to 90 km/h on paved roads, the MoD said. The APC variant will be able to carry 12 personnel, including the commander, driver, and gunner. 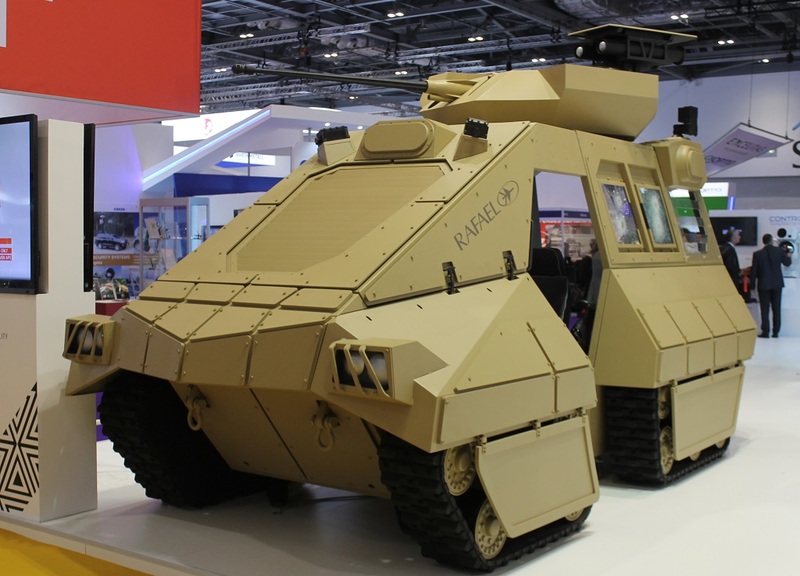 The MoD released photographs and a video showing a prototype of the APC armed with a Rafael Samson Mini remote weapon station. Brigadier General Baruch Matzhliah, head of the MoD's Tank Authority, said the prototype had begun a series of tests of its capabilities in recent days. The Israeli Defense Forces (IDF) will decide how many platforms it will order when the trials are complete. In addition to the APC role, the IDF's M113 variants currently serve as command vehicles, mortar carriers, missile launchers, ambulances, cargo carriers, and in several other roles. IDEX 2017: Eitan overseas build? Defence sources told Shephard that internal discussion in the Israeli MoD are giving consideration to manufacturing Eitan in the US and purchasing it with US military aid. But the MoD said that the Eitan is still in the development stages and has not yet been approved for mass production. It is the first 8x8 APC built in Israel and will gradually replace the ageing US-built M113 tracked vehicle that has been in-service since the 1970s. The vehicle was first unveiled in August 2016 by MANTAK and is due to enter service in 2020. Although it seems the MoD want to keep as much of the manufacturing in Israel, if capabilities are stretched then it could be General Dynamics in the US that could take on this work. GD already manufactures the Namer APC, which is based on the Merkava tank, at its facility in Lima, Ohio. A high ranking IDF officer told Shephard that Eitan is in the final stages of testing prior to its expected approval by the IDF. In December, in the Jordan Valley, a combat platoon from the 50th battalion of the Nahal brigade tested the Eitan during a battalion drill. The soldiers tested the Eitan using different scenarios, such as driving in fields, in mud, and unloading. For the time being the APC will be used regularly in the Nahal brigade and as a tool by the rest of the ground forces, for training and combat. 'Alongside the decision to accelerate the production of the Namer APC, it was decided to develop an additional tool, to complement it, which would enable fast, strategic mobility and maximum protection for ground forces. The series of exercises allowed the IDF to test the tool in a variety of terrains ahead of decisions regarding the volume of the purchase.' said BG Baruch Matzliah, head of MANTAK. Brig. Gen. (res.) Didi Ben-Yoash, formerly Chief IDF Armored Corps Officer, presented a simulation of Project Carmel – a future technology demonstrator for the IDF Armored Corps. The future armored platform will be light, agile, small, relatively inexpensive and simple to operate and designed primarily for operation in urban areas with the hatches closed. The Carmel platform will be operated by two crewmen seated side-by-side, one of whom will be the platform commander and both of whom will be able to execute all of the activities required in order to operate the platform. In order to enable operation by two crewmen only, a revolutionary decision-support system will be required. This system will carry out most of the activities currently carried out by the crewmen (including autonomous navigation and driving, target spotting, aiming, independent firing whenever possible plus other features). The crewmen manning the Carmel platform will only carry out the operations the system cannot execute on its own. The cockpit will be sufficiently spacious to accommodate an additional crew member, who would be able to operate external systems (e.g. ground/aerial autonomous vehicles and stand-off munitions). The third crewmen manning a unit command vehicle will be the commander of the relevant unit (platoon commander/company commander). The future armored platform will have a hybrid drive system that would enable, among other things, storing of energy so as to fulfill all future operational demands. The platform will be protected by a state-of-the-art active protection system and secured against cyberattacks. The new platform will be able to destroy enemy antitank detachments and rocket launchers. Owing to its small size and light weight, it will be able advance relatively easily through dense urban areas. Three industries (Rafael, Elbit Systems and IAI) are currently engaged in the installation of the systems required for the operation of the future armored platform by two crewmen. Rafael offered a transparent cockpit. Elbit Systems suggested that the tank be commanded using a crewman's helmet offering similar capabilities to those of the helmet Elbit Systems provides to pilots of fifth-generation fighter aircraft, while IAI offered a combination of both solutions. Zuletzt geändert von theoderich am 01. Aug 2017, 12:27, insgesamt 1-mal geändert. At a recent ground warfare conference near Jerusalem Brig Gen Baruch Matzliach, head of the Merkava tank directorate at Israel’s Ministry of Defence, provided some insight into what the future armoured fighting vehicle is going to look like in 2025. Matzliach explained that the army needed to create integrated operating systems which includes three protective layers to the tank including the Trophy active protection system. ‘The Trophy system became operational in 2010 and consists of four antennae and interceptors. The radar antennae detect the threat and the system blows it up a few dozen metres away from the tank,’ said Matzliach. The system provides a solution for the missiles but does not meet the need of the IED threats. ‘The only way to really meet those needs is a combination of the two, only then can we get good protection of that specific AFV. The Trophy can meet the needs of the army in facing kinetic threats, it can also repel RPGs depending on the warhead,’ said Matzliach. As the IDF develops methods dealing with current threats, another evolution is taking place with the installation of new sensors and computer systems fitted to the vehicles. The challenges, according to Matzliach, concerned what he termed the ‘disappearing enemy’ which arrives, attacks and retreats within seconds. Meanwhile Armored Corps combat teams will soon have a range of upgraded vehicles, including the Merkava Mk4 ‘Barak’ main battle tank that is currently being developed. The Merkava Mk4 Barak is designed as a ‘smart-tank’ with fused sensors to identify the enemy and enable rapid fire closure that allows elimination of the target before it disappears from view. ‘What we are going try to add to our vehicles is integration of the protection bringing the radar into the tank which will immediately identify anything on the move in addition to the information coming in from other vehicles,’ added Matzliach. He explained that MoD does not have any practical plans for the development of the next tank at the moment. The Merkava Mk4 is expected to be upgraded, within the next four years, to the Barak version that is expected to remain in IDF service for the following decade. 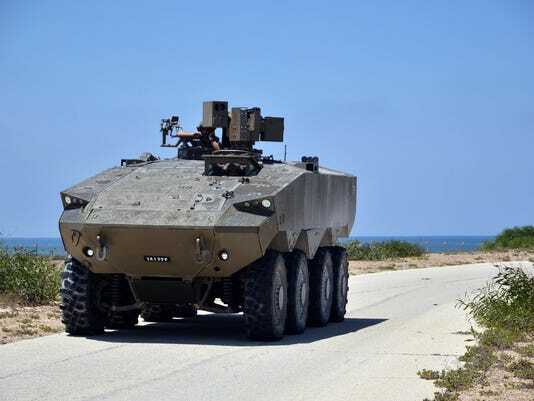 The Israeli Ministry of Defense (MoD) has unveiled a prototype of an upgraded version of its Namer heavy armoured personnel carrier (APC) fitted with a turret that is armed with a 30 mm gun. In a statement released on 31 July, the MoD said the prototype was developed by its Merkava Tank Administration together with the Israeli Defense Forces (IDF) Ground Forces and will begin a series of trials in the coming days. 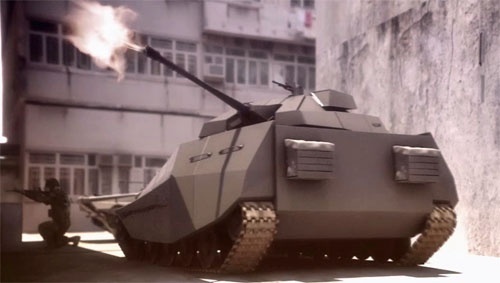 Brigadier General Baruch Matzliach, head of the MoD’s Tank Administration, said the turret is unmanned and does not penetrate the vehicle’s hull, so does not impact its ability to transport soldiers. He said it will be integrated with an active protection system: a reference to the Rafael Trophy that is already being fitted to the IDF’s Namers. The MoD released a video showing the turret with Trophy radars fitted to either side of the gun and countermeasures dispensers on both sides. It also had two sets of electro-optics: one mounted coaxially to the left of the gun and a second that appears to be able to rotate independently of the turret. The gun appeared to be an Orbital ATK Mk44 Bushmaster. The turret upgrade is at an early development stage and not all the IDF’s existing Namers will be fitted with the new turret, a defence source told Jane’s . בימים אלה החלו מנת"ק וזרוע היבשה בצה"ל בסדרת ניסויים ראשונה בנגמ"ש נמר, שעליו מותקן לראשונה צריח בינוני ("צריחון") בעל תותח 30 מ"מ. הצריחון פותח להתקנה על שני הנגמ"שים שמנת"ק מפתחת ומייצרת עבור צה"ל: הנמר, והנגמ"ש הגלגלי הראשון "איתן", שנמצא בימים אלה בסדרת ניסויים כחלק מתוכנית הפיתוח. הצריחון פותח להתקנה על שני הנגמ"שים שמנת"ק מפתחת ומייצרת עבור צה"ל: הנמר, והנגמ"ש הגלגלי הראשון "איתן", שנמצא בימים אלה בסדרת ניסויים כחלק מתוכנית הפיתוח. The IDF and the IDF's Ground Forces have recently begun a first series of experiments on a Namer armored personnel carrier, on which for the first time a medium turret (30 mm cannon) is mounted. The turret is being developed for installation on the two armored personnel carriers which are developed and manufactured for the IDF: the Namer, and the first armored personnel carrier Eitan, which is currently undergoing a series of experiments as part of the development plan. According to Cost, the batteries to be tested soon by Israel’s Tank Development Authority are designed with residual capacity to ensure that, even when empty, there’s enough power to restart the main engine. Moreover, they provide an automatic alert to crews when batteries are drained.